And Happy Birthday to my Aunt Elsie who is a leap year baby!! We finally had our town hall meeting where Derek, Laura and I were recognized for our one year anniversary! We got these nifty plaques and a $100 gift certificate to giftcertifactes.com! I got mine for TJ Maxx and I can't wait for it to come!! When I went down to Bonaventure, Lindsay and I exchanged Christmas presents (we were both too lazy to mail!) and she gave me my Birthday present! One included a gift card to Pier 1 that I spent today! I bought a new Springy runner for the table and two place mats! This neat accent piece was on clearance for $10! I also got the vase and fake plants from pier 1 last year! And this spoon holder was only $3! We needed one of these BADLY! Oh man and guess what was on TV tonight! THE WIZ! HAHAHA! Last night I went with some friends to Dave & Buster's! It's pretty much an adult arcade with a bar and restuarant. We got beers and all raced each other! I felt like a kid!! Then we went across the street to a bowling alley for Karoake!!!! It was tons of fun! Tonight I was thinking about the time I ran away from home. I made it as far as our back yard, and set up camp under one of our cherry trees. Convinced I would live there forever, I busied myself by setting up my straw bed and collecting dandelions to eat later. All calls (and chuckles) from my mother went ignored. I don't remember what made me go back inside, or how long I actually stayed outside! Awww to be young with complete innocence and imagination! Monday I handed in my Daffodil money to the American Cancer Society! 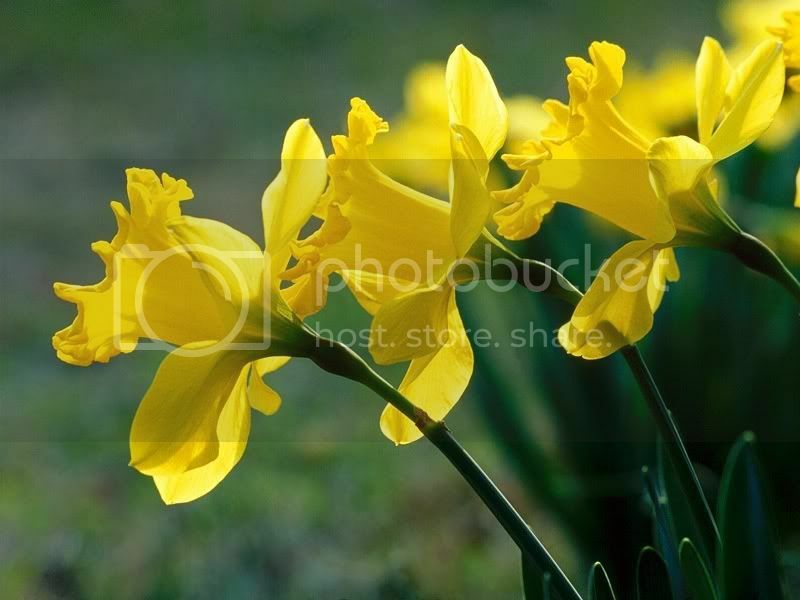 Come March 10th, our office will be littered with $450 worth of beautiful, yellow, Daffodils!! Well I have too many pictures to post and too many stories to tell!! So yes, I had TONS of fun!! After 1.5 years, I FINALLY got to see my best friend again!! That's TOOO LONG! This was pretty much our group all weekend. We stuck together and welcomed all! Here we are waiting for our Burton Bugers! YUM!! After all the fun I still had the energy to come home and make hamburger soup, clean my room, clean the kitchen, scoop the kitty litter and sweep the bathroom AND bundle up the trash! WHEW! Wendy made pink rice crispy treats! YUM! My Mom was my Valetine and sent me a nice card and a Dove Chocolate bar from their Beautiful campaign!!!! Wendy, Derek & I all in red! He found it right away! A nice, full plant! We're keeping this one hidden on top of the fridge! Oh, and I forgot to post my homemade mac and cheese casserole from Tuesday nighy! YUM! It works by integrating an optical fiber system that displays an image between two glass parts. There are 12 micro lighter fibers, that throw image components to the glass, that offer a quite good luminosity, and keep the mobile phone concept as light as possible. All lights only appear when you open the phone, by pushing removable part on the side of it. The brainchild of French artists Francois Delaroziere and Pierre Orefice, the Mechanical Animal project is an ongoing initiative that began in 2007 with the debut of a massive mobile elephant sculpture over 12 meters tall that can carry 45 human passengers on its back—who, in turn, can operate the animal’s trunk and trumpet call themselves—as it walks along city streets. The project’s second stage, a collection of interactive marine life that will populate a massive multi-story carousel, is currently being constructed with a projected debut date of Summer 2009. Currently, the entire collection is housed in a turn-of-the-century warehouse that once served as the city’s shipbuilding hub and is open to the public for viewing daily. Happy Valentine's Day to all the Lovers! Let me just tell you all that I CAN NOT FRICKIN WAIT UNTIL THIS WEEKEND! I haven't been back to St. Bonaventure in awhile! But, first and foremost I am most excited to see my MOST BEST friend in the entire world, LINDSAY FOLSOM!! I haven't seen her since June 10, 2006 when she put me on a train back home! That is tooooo long for best friends! Wendy bought Angel a brand new kitty litter box! WITH A DOOR!! Hopefully now the litter will stay inside! I've fallen behind on blogging! I'm trying to catch up now! My team at work got me a Mickey Mouse card and cookie cake! YUM! AAAAND I got BEAUTIFUL pink gerber daisies and a balloon from my Mom and Dad! It's almost time to peace out of work and start the party! Wendy gave me a cupcake and sang to me! Then Wendy and I went to Tera White's house where she had a fabulous dinner waiting with one of her amazing salads with cranberries, BBQ Chicken and homemade mac and cheese! YUUUUUMMMMMM!!!!! AND SHE EVEN BAKED A CAKE!! The First of Birthday Festivities! On Saturday, Mom and Dad came to visit with presents, a cake and pizza! My presents all had the perfect theme: COOKING!! Four Emeril spice dishes for cooking and serving, a meat themometer, four steak knives, Four cooking knives plus prep block, a recipe box plus cards, two dish towels and two pot holders!!!!! WOOHOOO!!! Knives include a 5" Chef Knife, 5" Serrated Bread/Utility Knife, 5" Santoku Knife and 3.5" Santoku/Parer Knife!!!!!! I believe my prep time was just SLICED in half! hahaha! And the other is my very own reciepe box with matching cards! Plus the top opens to find a notepad and pencil! Absolutely awesome! Then we went to Red Lobster for dinner for some much craved seafood! I got the "Create Your Own" (same as Mom) and Dad got the "Ultimate Feast!" And, we did manage to save room for cake of course!